← Egypt and Iran—odd bedfellows? A new Grand Mufti chosen; many activists surprised by the pick. 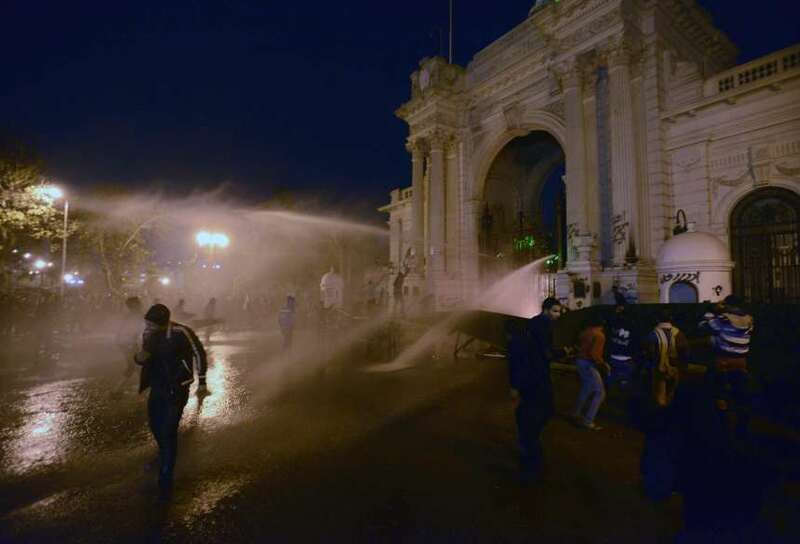 Modest countrywide anti-Morsi protest, clashes at Presidential Palace. Muslim Brotherhood denies torturing political activists. Islamist MPs in Shura Council blame protesters for Tahrir rapes. Contractors abandon business in Egypt. 39 arrests in Monday’s clashes between protestors and police. Presidential spokesman: Cabinet change is not imminent. Egypt court jails Israeli man for two years. Moody’s cuts Egypt’s credit rating citing unrest, and IMF doubt. Vigils in 35 countries condemning harassment of Egyptian women. Egyptian police hold rare protests. US State Department official concludes ‪a visit to Egypt. Diesel shortage pushes Egyptians to the brink. Cabinet approves new protest law. Thousands worldwide protest sexual assault on Egypt’s female demonstrators. Suez Canal revenue slides 9% in January. Kill-the-opposition-fatwa cleric is released on bail. Egypt’s military offers a rare apology for a child death. IMF not aware of receiving Egypt’s revised plan. Opposition forces call for mass demo at Qubba Palace on Friday. Calls for Friday rally against political violence divide Egypt’s Islamists. Communication Ministry’s statement regarding ban of YouTube. Salafist Nour party meets with NSF in closed-door talks. ‘Adultery, and obscenity.’ Salafi preacher describes Valentine Day. FJP aims for outright majority in the new parliament. Egypt’s alcohol ban raises doubts for the country’s tourism future. Missing activist found bound, naked, tortured in desert. NSF and Nour party agree that Qandil cabinet must go. Protesters continue clashes with police around Qubba presidential palace. Egyptian police publicly beat to death a man suspected of killing officer. Funds allocated to diesel subsidies have run out. Court shut down belly dancing channel. President’s son may be earning just $133 a month. Ministry of interior agrees to arm police with 100,000 rifles. Music legend Umm Koulthoum’s statue gets covered by niqab. In addition to the ongoing Brotherhoodization of Egypt, President Morsi and the Muslim Brotherhood wanted to send a strong message that they were not willing to compromise. Support from Prime Minister Qandil and the current government and Friday’s rally “against violence” are part of this strategy. Although the Brotherhood announced only a symbolic support for the rally, a prominent member of the Brotherhood Al-Beltagy spoke at the rally. The aim of this rally was not just to blame the opposition, but Islamists also wanted to create a perception of “perfect protests” that are well organized, peaceful, and thug free. This perception is fundamentally flawed; Islamist rallies are non-violent because they are member-only rallies. Each participant is expected to conform to a desired code of conduct (which is currently non-violent). Non-members are welcome to join only if they adhere to the same code; otherwise, “informal thugs” within the organized group will deal with them promptly. Opposition rallies by nature are completely different, as they focus on enticing all of the non-Morsi protestors to join in; many are angry, unemployed youth with simmering grievance, exactly as Islamists youth were during the Mubarak era. In short, the Islamist rally mainly aims to show off, while the opposition rally tries to force a change. The problem for the opposition is not just that their rallies have become synonymous with violent confrontation, but also the dwindling numbers of participants and the changing dynamics among the various groups that participate. Both Monday’s demonstration on the anniversary of the overthrowing of Mubarak and Friday’s protest at Qubba palace were marked by minimal participation, and I also find Wael Eskander’s account about the Ultras very disturbing. Whether they like it or not, the stigma of violence and unpopularity has started to catch the opposition, and it will be difficult to shake it up. They have fallen into the Brotherhood’s trap, and ordinary Egyptians will think twice before joining a violent protest. It’s time for the opposition to give protest a tactical rest – it is overused and, frankly, pointless. Instead, it should focus on forging a wider alliance against the Brotherhood, even if that includes agreement with Salafi parties, like Nour, whose members are no longer willing to give Morsi an easy ride. The political outcome of this is by far more substantive than what protests can achieve at this stage of the struggle. As Ibrahim El-Houdaiby aptly explain: “opposition forces should focus on what they would do if the Brotherhood didn’t exist, to present an alternative the people can believe in.” I think we should not be over optimistic about today’s meeting between the Brotherhood’s Katatni and ElBaradei. I doubt that one meeting will bridge the wide gap between the two sides. If anything, this meetings indicates that the brotherhood leadership is worried by the ongoing deliberations between Nour party and the non-Islamist opposition. I read several interesting remarks this week about Egypt, one of which was made by Marc Lynch. In his piece about Egypt’s policy challenge, he described (within a different context), a “liberal narrative.” Aside from my pedantic insistence that the opposition bodies in Egypt are non-Islamists rather than liberals, I genuinely think the problem is not in the narratives, but in core definitions. Islamists and non-Islamists disagree on what is black and what is white; no wonder consensus is a mirage. The struggle is confrontational in nature until one side scores a clear winner. Testimonies of the battle of Mohamed Mahmoud. El Nadeem Centre. This entry was posted in Diary of Aak, Egypt and tagged Economy, Egypt, Morsi, Muslim Brotherhood. Bookmark the permalink. Many thanks.Truly appreciated,and Ilook forward to your feedback.